I started tracing the patterns and cutting Yesterday. 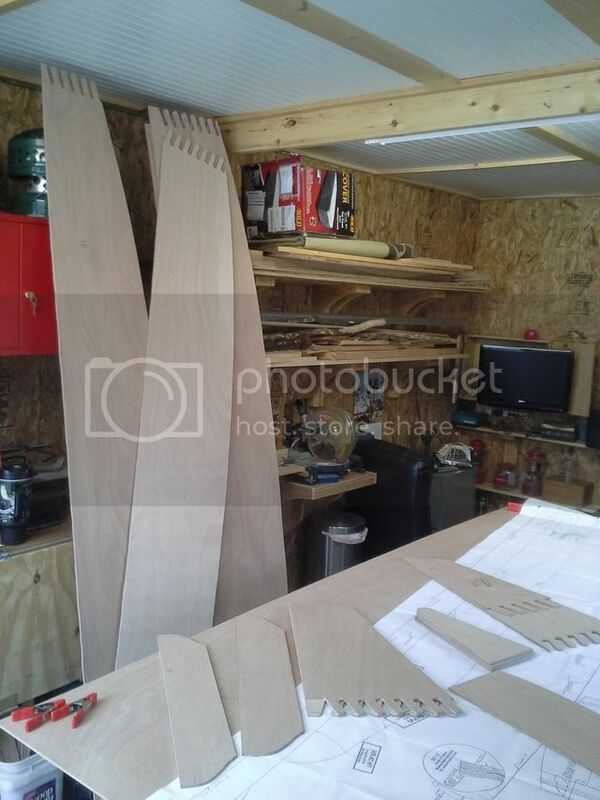 Got about 1/2 of the pieces cut. The patterns began to make more sense after reviewing the instructions a few more times. 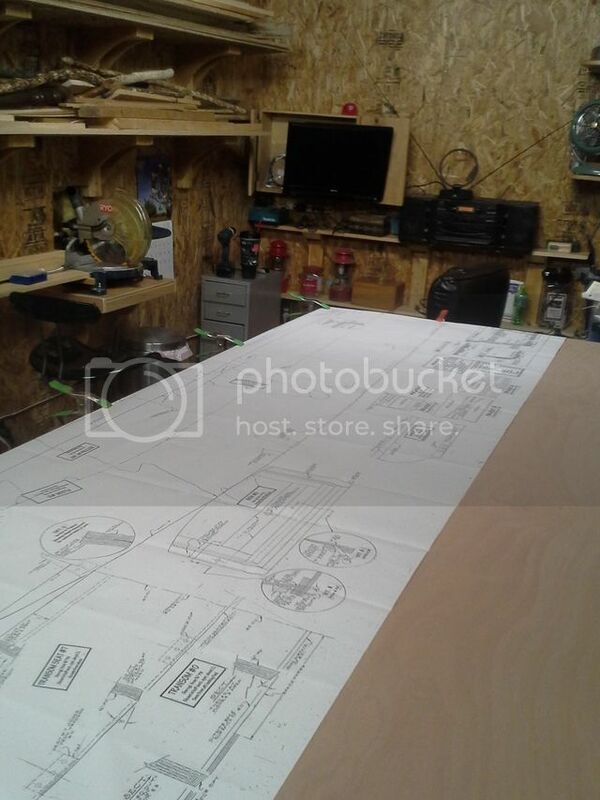 I hope to finish cutting out all the parts in the evenings after work this week. 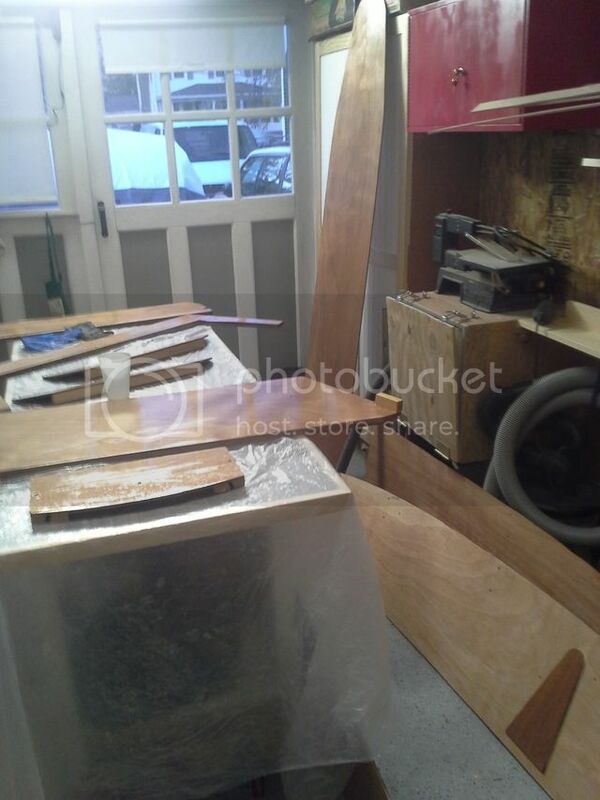 I am lucky to have easy access to good Okoume ply only about 1/2 hour away at Chesapeake Light Craft. They have some pretty impressive Kayak and small dinghy kits. I also needed a small piece of good solid wood for the build and found a nice scrap of Cypress there that should work well. This next weekend I should be ready to do some joining with epoxy and working on the various attachments. Not sure if I should buy everything separately or go ahead and get the Glen-L kit. It seems that getting the kit will save a lot of time and hassle and money saved could be minimal. Any advice on that is appreciated. Last edited by BillS on Sun Jun 19, 2016 11:34 am, edited 1 time in total. I haven't actually seen this design built before. It does look interesting. Glad you went for Okoume. It is lighter(which I'm sure you wanted.) and is really good to work with. I think the Glen L kits are very good and should provide the right materials. Good luck on the build. Really looking forward to seeing an actual build of this model. Excited to follow your progress. Please post many pics. This past week I managed to get most of the remaining pieces drawn and cut. 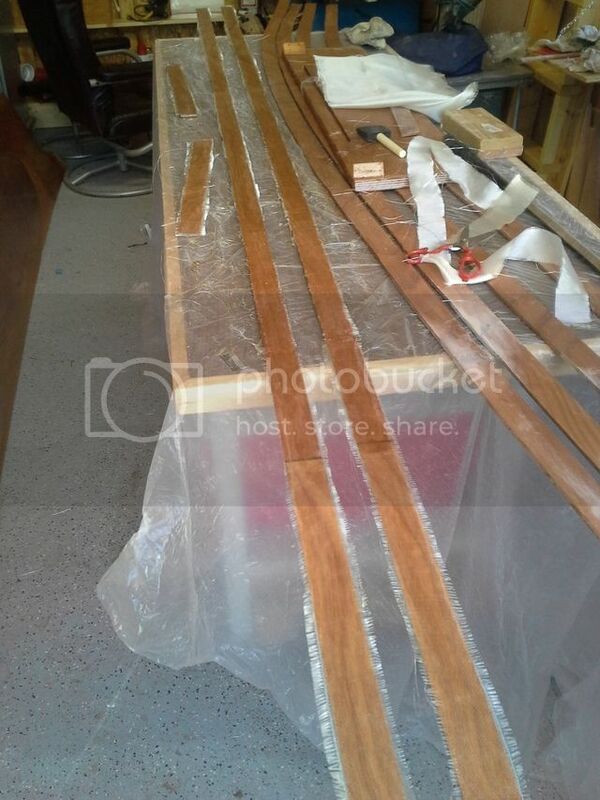 The only things left are the long slats that will be used to screw down the rubber material to the boat After cutting I also got the puzzle joints epoxied on the 10' floor and wall sections. 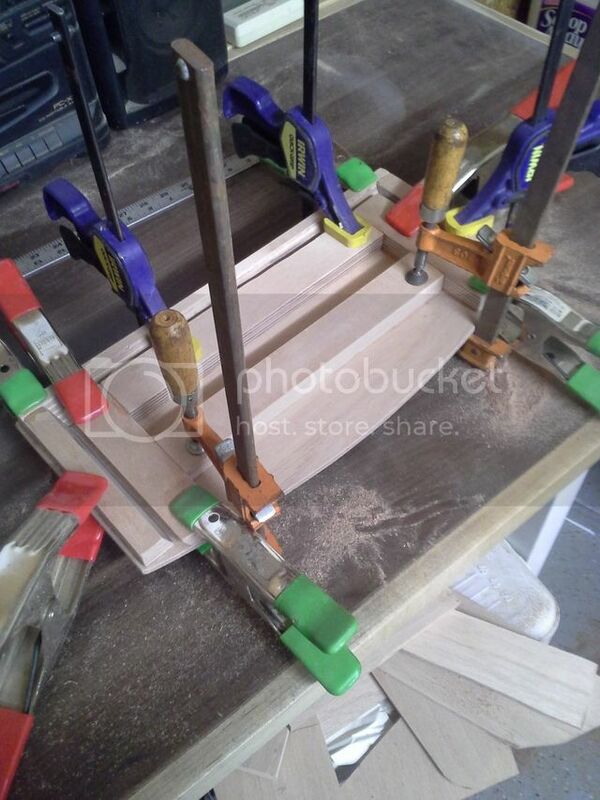 I bought the puzzle joint ply to avoid scarfing, which I wasn't comfortable doing on 1/4" ply. as it turns out, however, my layout had to be different than the plans and I missed fitting all the joined boards over the joint by 1 inch. 1 piece will have to be scarfed anyway. Oh well. 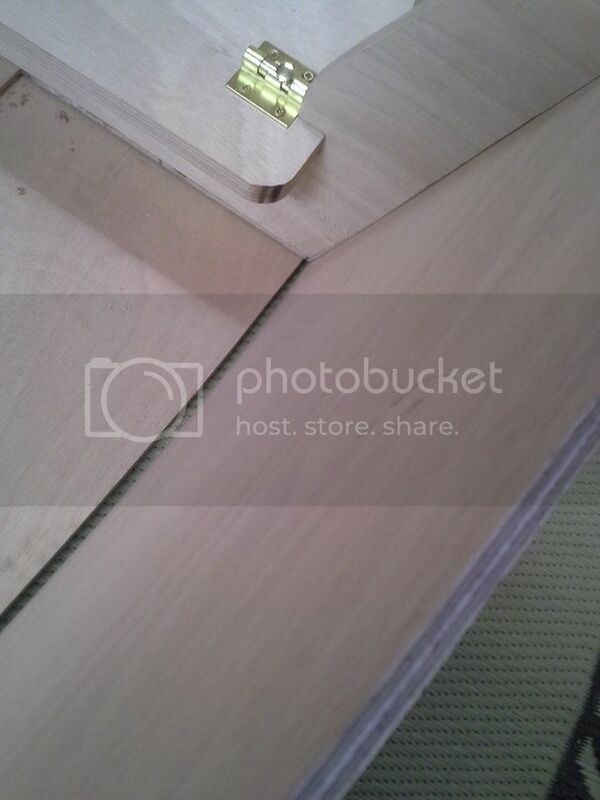 Next will be sanding the rough edges and getting a better idea how all the parts fit together. I am undecided yet if I should glass the puzzle joints. The guys at Chesapeake Crafts where I bought the wood said that epoxying the joint is sufficient but since I will have a scarf joint to glass anyway, it would probably make sense to do all of them and not worry about it. It seems like I may be the only one who has built the fold up and posted about it. I'll try to document the build as I go so that others can learn from the inevitable mistakes that will come. The second pic is of all the pieces. A little progress this week. Most of my time was spent making sure I understand the instructions fully, to prevent any mistakes. 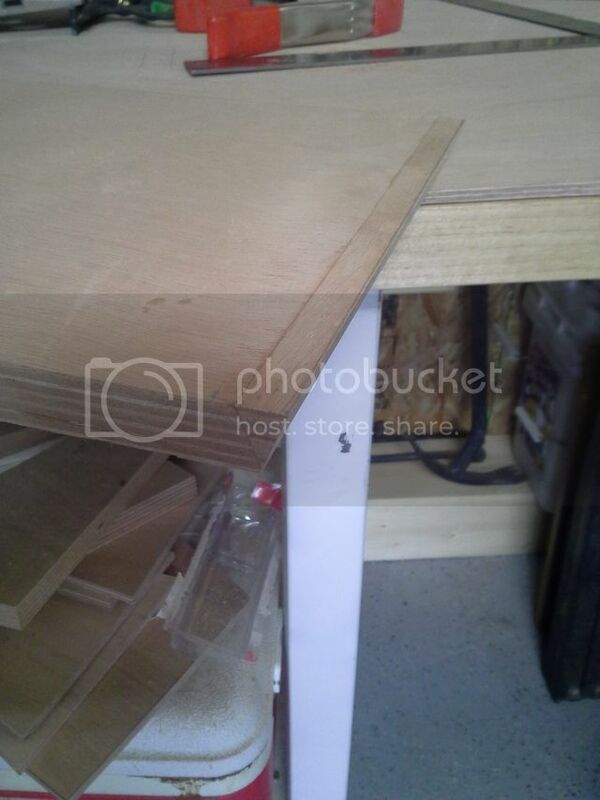 I did the scarf joint that I needed to do. It was to attach about 10" to the end of one side. It isn't pretty but should work fine after I glass it. 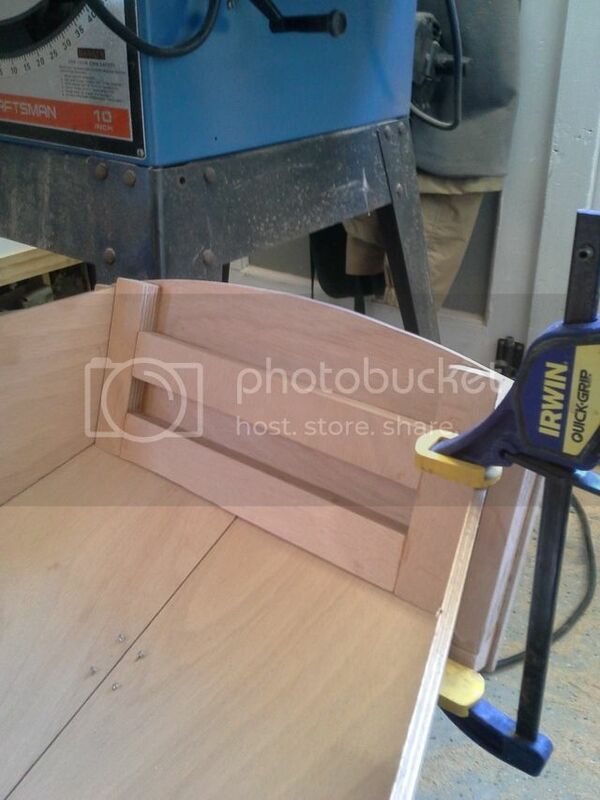 The seats needed a 5/8" groove on the underside for the seat supports to fit. I pulled out the router and finished that task. I then went over the parts and started to mock up for fit and see that things made sense. 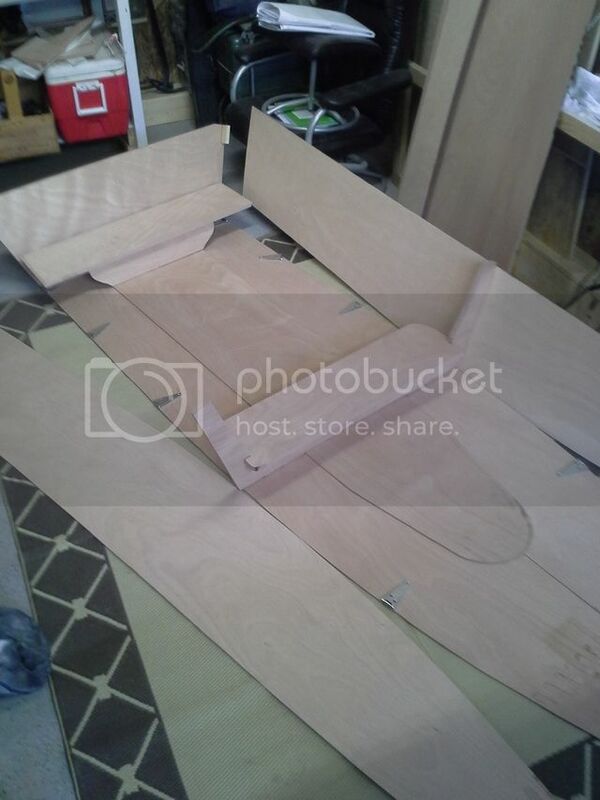 This pic shows the floor, which will sit on top of the boat bottom, along with the transom, brace, and seats in place. I missed that the rear seat was supposed to have a 20 degree angle on the side edges, facing down. 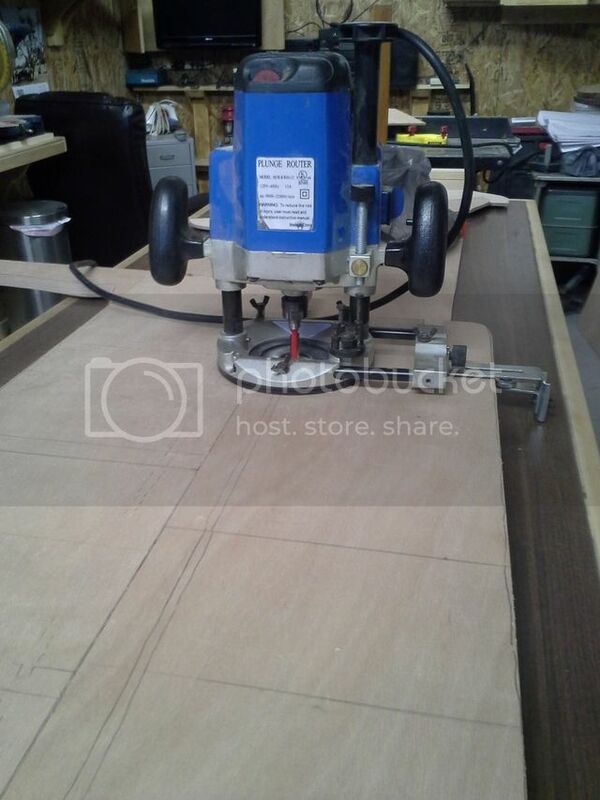 So I set up the table saw and made the first cut. Right after cutting, it became apparent that the angle was facing up, not down. First big mistake! 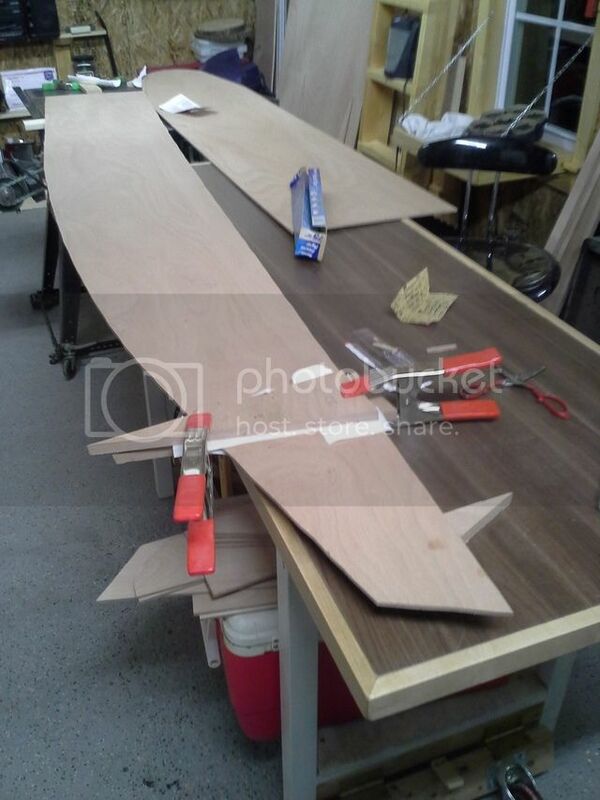 Immediately I had visions of having to travel to Annapolis for more wood, would they have any scrap big enough or will I need to buy a whole 4x4 sheet, etc... but then sanity took over and I realized that I could glue a piece on the end and re-cut. So I did and it turned out just fine. 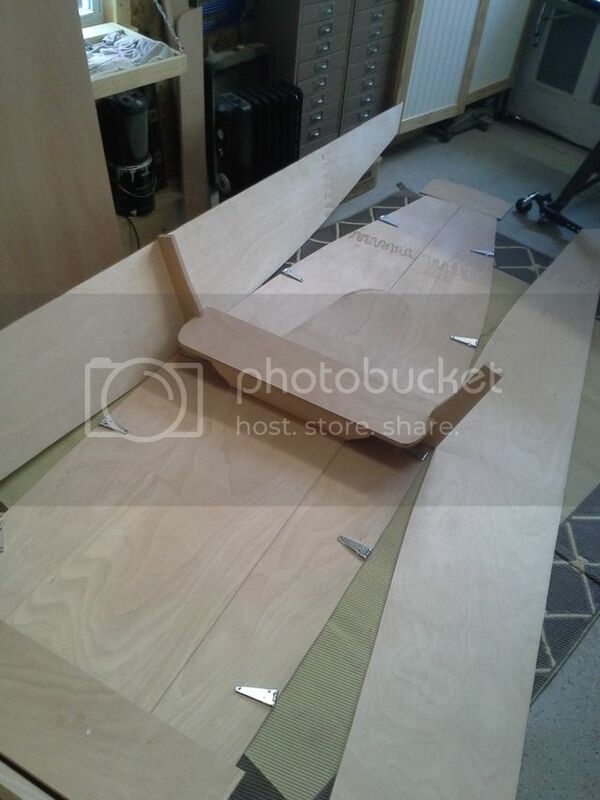 This week, I will be installing blocking and fasteners in the mock up phase. 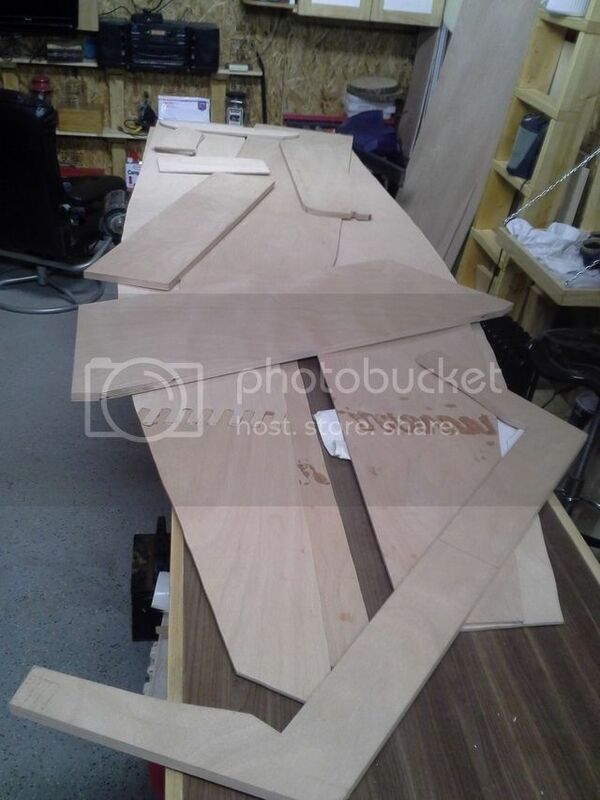 These pics show the layout of all the pieces. 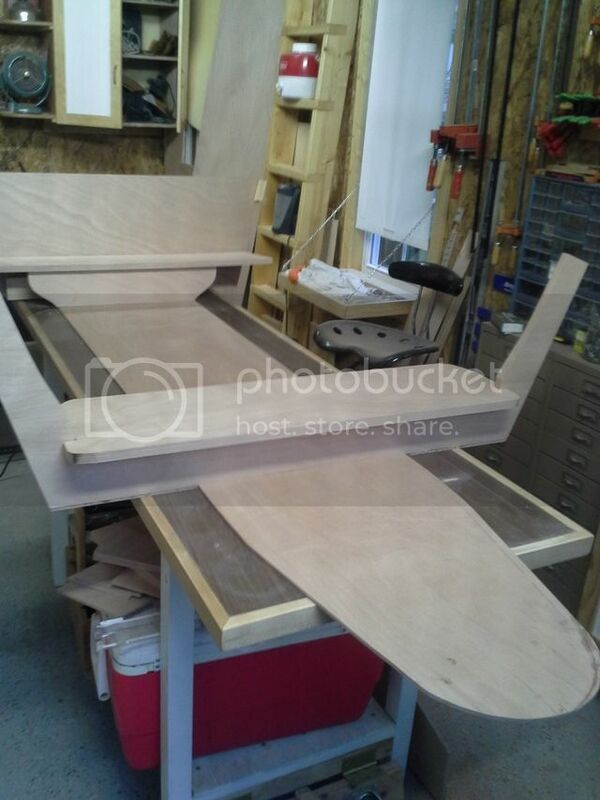 Almost looking like a boat! I got some more done this past week. 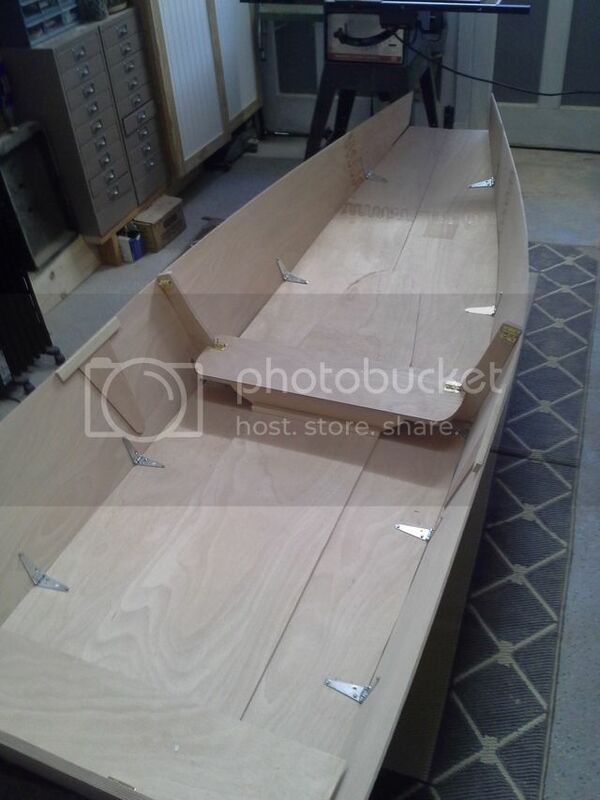 I finished installing the side/bottom hinges, the seats and seat supports, bracing for the oars, various support blocking, and made the bow piece. I was please with how well the pieces fit together. A sander should be able to fine tune a few trouble spots, like in this pic where the frame forces the side out a little too much. This week I have a few more hardware and blocking pieces to attach, then fine tuning the fit. Next weekend I hope to start epoxy! 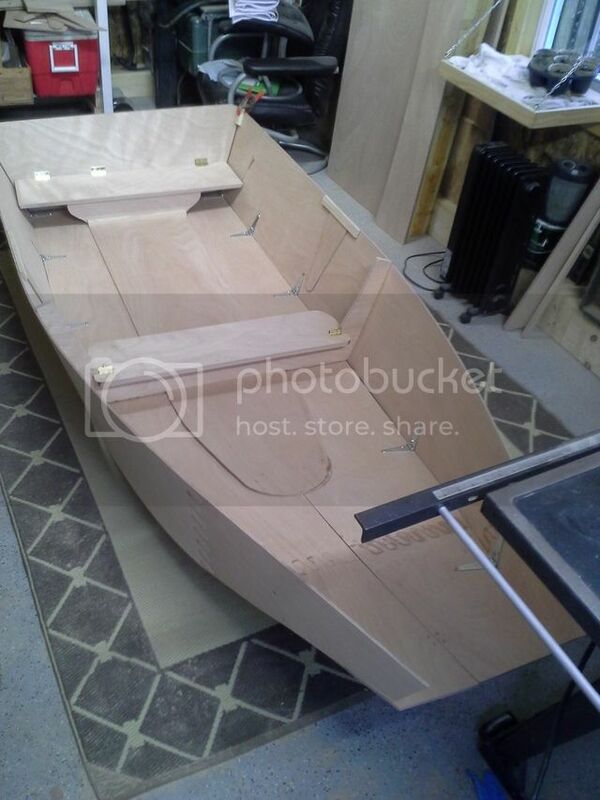 I have been steadily working on the boat the past couple of weeks but not much to show. 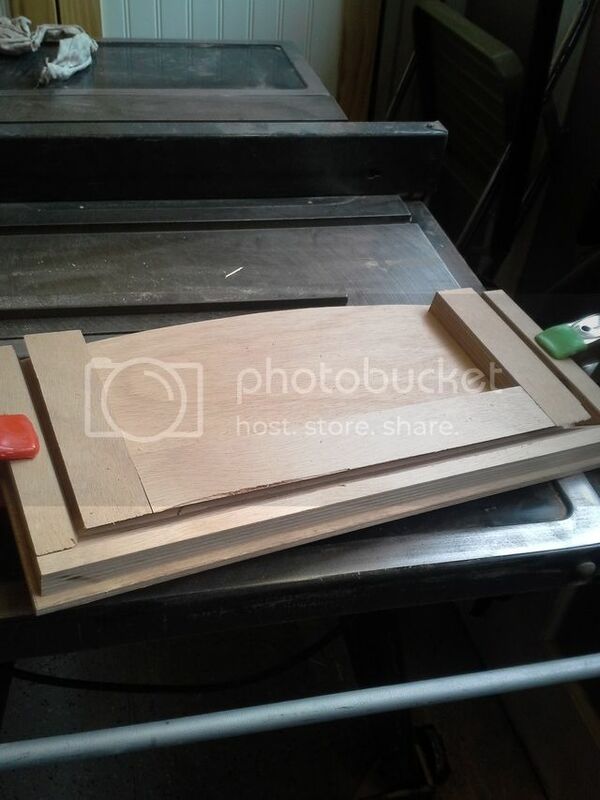 I finished the dry fit and cut out the slats that will hold down the seam material. Today I finished the seal coat of epoxy on all the pieces using Glen-L's product. It is my first time applying epoxy and I felt like I got the hang of it after the 3rd mix. No glass is required for the build and my joints feel solid enough that going with epoxy only seems like it will work. It's taking longer than I thought, a little over one week to apply the first coat. Some of the problem is there is not a lot of room in my little shop for sitting pieces to cure. Epoxy took much longer than I anticipated. Still a little bit to do. 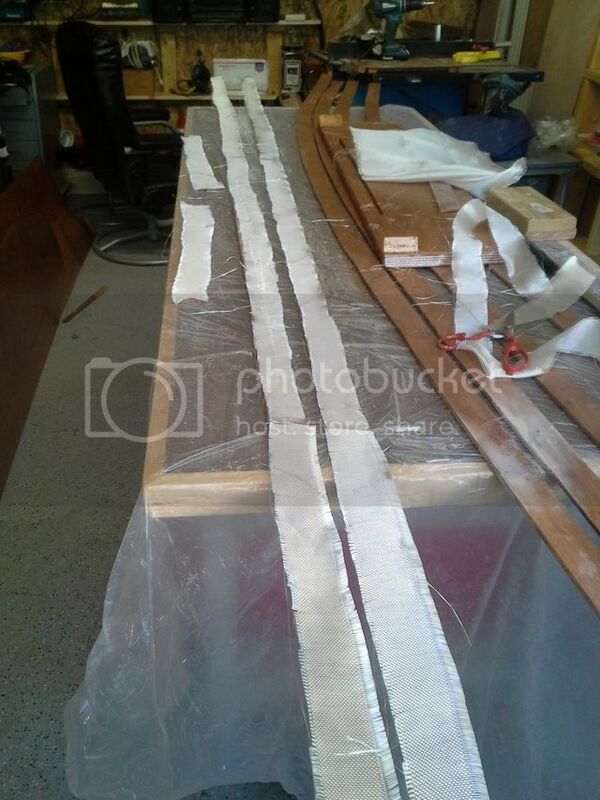 I decided to glass the 4 strips that will run lengthwise at the center and edges down the bottom of the boat. 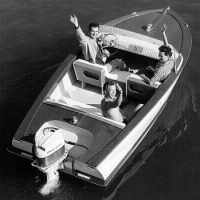 They are used to hold down the seam material that will allow the boat to fold. They also will be the pieces most likely to get the most contact with anything I run over so it made sense to me to treat them as bottom "rub rails". I started sanding yesterday in preparation for paint and have decided to use Interlux Brightsides along with the corresponding primer. From all that I have read, I seems to be a good combination of quality, price, and ease of use. I prefer to sand outside but it has rained here for something like 23 of the last 25 days. Unusually cold, too. hopefully that turns around soon. Really cool build and NICE work!! !